Snowboarding has now become a sport for all generations, but plenty has changed since the days of the first boards in the 70s. Modern snowboards are made from carbon fibre and are therefore especially light and supple. The newer bindings systems also allow far easier use, so that little stands in the way of your enjoyment. Naturally Ski Rent has reflected these trends and we are proud to offer more than 50 snowboards from top suppliers (Atomic, Oxygen, Nidecker and Palmer) in all sizes. With this range we can offer the ultimate in boarding fun for everyone from the age of 6 (smaller children find snowboarding too hard because of their body proportions). Performance snowboards for those who are looking to improve. The same high standards for adults are repeated in our range of equipment for children of between 6 and 14 (snowboarding is normally too difficult for those under 6). 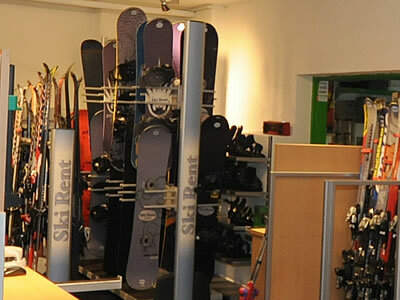 Save 10% and book your snowboard equipment now! Our soft boots are all from the Flow system and thus are perfectly suited to the bindings. Sizes from Continental 30 to 49 are available. For the individualists amongst you we also have all the usual sizes in hard boots in our Ski Rent hire collection.